A thunderstorm moving through Melbourne, Australia led to multiple deaths and a huge influx of people seeking medical attention late last year, but it wasn’t heavy rains, howling winds or lightning strikes that hurt the population of southeastern Australia – it was a slew of respiratory problems, including asthma. The day had all the classic ingredients of an asthma epidemic, including high rye grass pollen concentrations, a strong multicellular thunderstorm system moving across the region, and a large population of several million people near Melbourne. Strong, gusty winds exacerbated the spread of pollen grains and allergenic contents, which increased population exposure. Researchers at the University of Georgia are studying the November 21, 2016 storm, which killed at least 4 and sickened 8,500, in an attempt to learn how to forecast and prepare for similar events the next time they occur. According to their study published in the Journal of Applied Meteorology and Climatology, asthma symptoms are aggravated when the rainfall, winds and lightning brought on by thunderstorms combine with pollen or mold spores in the air. Their findings indicated that Downdraft Convective Available Potential Energy (DCAPE) levels reached “high” to “very high” thresholds for strong downdraft winds in the lead up to the event, which was actually a collection of small thunderstorm cells. As the storms rolled through, emergency managers sent out a severe thunderstorm warning, but otherwise saw nothing unusual, according to State of Victoria Inspector General Tony Pearce. However, calls for ambulances quickly started to spike, and by the end of the night hospitals were receiving more than 300 patients per hour with respiratory problems. Researchers involved in the University of Georgia study are hoping their findings can help prepare for similar weather events in the future and prevent such widespread epidemics. 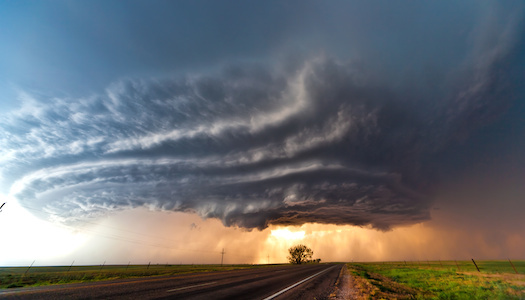 “This information may be useful for diagnostic and prognostic assessment of epidemic thunderstorm asthma and in providing an early warning to health practitioners, emergency management officials, and residents in affected areas,” researchers wrote. You can read the full study, The Role of Mesoscale-Convective Processes in Explaining the 21 November 2016 Epidemic Thunderstorm Asthma Event in Melbourne, Australia, here.